An illustration of the solar wind as it streaks by the Earth. When the solar cycle was at a minimum level in 1996, the sun sprayed Earth with relatively few, weak high-speed streams (left). In contrast, the sun bombarded Earth with stronger and longer-lasting streams in 2008 (right) even though the solar cycle was again at a minimum level. Justlooking at the number of sunspots doesn't provide a full picture of how thesun's solar energy impacts Earth, a new study suggests. The findings contradictprevious thinking about how the sun behaves during low points in its solarcycle. "Whatwe're realizing is that the sunspotsdo not tell the whole story," said Sarah Gibson, a scientist from the National Center for Atmospheric Research (NCAR) in Boulder, Colo.
Sunspotsare areas of concentrated magnetic activity that appear as dark dots on thesun's surface. The number of spots periodically rises and falls in what hasbecome known as the solar cycle. This cycle lasts about 11 years, takingroughly 5.5 years to go from "solar minimum," or a period of timewhen there are few sunspots, to the cycle peak, or "solar maximum,"during which there are many sunspots. Duringcycle peaks ? the next one is expectedin 2013 ? there are frequent solarflares and geomagnetic storms, events that send out radiation that canbombard the Earth's atmosphere, damaging satellites and disrupting power grids.Scientists say that a really bad solar storm, akin to one that startedfires along telegraph lines in 1859, could bringmodern society to its knees. Conversely,cycle minimums were thought to be very quiet times, periods when the Earthwould not experience as many blasts of solar energy. But Gibson's study showsthat this is not necessarily the case. Gibson andher colleagues compared measurements from two different cycle minimums ? onefrom 1996 and one from 2008. They analyzed a type of solar energy called thesolar wind ? streams of charged particles that accelerate out from the sun'sextremely hot atmosphere. The solar wind, unlike short-lived solar storms,streams from the sun pretty much constantly but with varying intensity. They foundthat, while the solar winds intersecting the Earth largely disappeared in 1996,they continued to hit the Earth at full force in 2008. Theseresults show that "what we thought was a typical solar minimum wasn't, andwhat we're seeing now is a different animal," Gibson said. Scientistspreviously thought that during solar minimums, solar winds would simply blowout the top and the bottom of the sun, and not come out near the equator. Sincethe Earth is close to the same latitude as the sun's equator, it shouldn'texperience much solar wind during a low point in the solar cycle. "Ifyou imagine holding a hose and you hold it straight up, you would spray up, andif you had a friend standing nearby, they might get a little wet, but notsoaked," Gibson said. But during the current solar minimum in 2008, thefire hose was still pointing at the Earth. "Thelast two solar minimum, this didn?t happen. When the sun spots went away, thesefire hoses went away too," she said. In fact,the solar wind's effect on the Earth's radiation belt ? a ring of chargedparticles around the planet ? 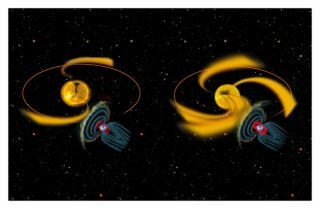 was three times greater in 2008 than in 1996.While the effects of solar winds aren't as drastic as those of a solar flare,they can still interfere with satellite orbits and radio communications. This year,the solar winds are starting to taper off. However, Gibson was surprised thatthe reduction of winds lagged so far behind the decrease in sunspots. What couldaccount for this difference in minimums? Gibson thinks it may have something todo with the fact that this cycle's minimum has been historically wimpy ? therewere fewersunspots during this minimum than during any minimum in the last 75 years. "In aminimum when you have a really strong polar field, it can clamp down everythingelse at lower latitudes down towards the equator, and really the only action iswhat's coming out the poles, and you get what we thought was a classic solarminimum picture, and you don?t get any wind escaping," Gibson said. "Butbecause we have such a weak magnetic field this cycle compared to last cycleminimum ? the polar field is not as strong, it can't clamp down, and stuff kindof escapes, you get these streams that squirt out at lower latitudes near theequator instead of just at the poles," she said. Scientistsare trying to learn more about the solar cycle to understand why it occurs andwhat accounts for cycle differences. The solarcycle is "something that's become very important to understand in thespace age because we have all these satellites, we have astronauts out there,and you have to know what space whether they're likely to face," Gibsonsaid. The studywas led by Gibson, and the research team included scientists from NCAR's HighAltitude Observatory, the University of Michigan, NOAA and NASA. The resultswill appear this week in the Journal of Geophysical Research. Theresearch was funded by NASA and the National Science Foundation.